Hi Darlings and happy hump day! I am back to back DIY’s this week, lol. 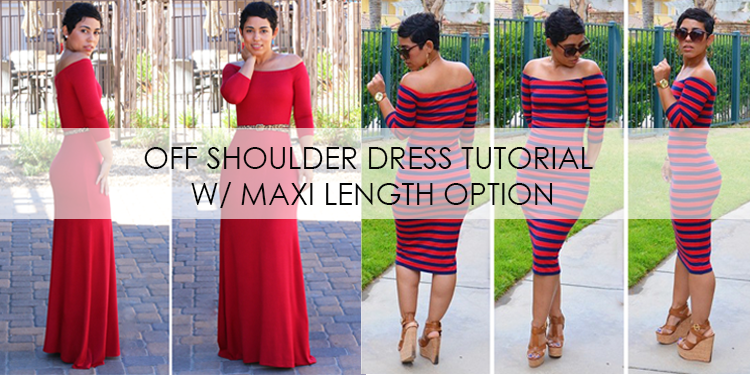 This should look familiar to you guys because it’s my OFF THE SHOULDER TUTORIAL…this is a go to dress for me when I need something new and fast for a meeting or a dinner date or to wear it with sneakers! I had a dinner meeting last week and since I didn’t have a thing to wear (yes I know how ridiculous that sounds) ha! I made a quick fitted dress to wear. 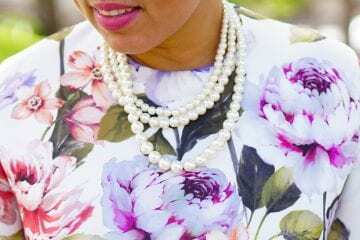 The TUTORIAL is super easy and probably one of our best sellers since you can make it fitted or as a maxi dress. The fabric is a gorgeous HUNTER GREEN PONTE I picked up HERE (use code MIMI45 for 10% off online) I am OBSESSED with hunter green this season and you will probably see me wear it a lot. Next ArticleClinique Pop Lipsticks + 3-Step Skin Care System! You are so funny, fitted is the correct term for this dress. All your dresses are perfect. You look Ah-mazing as usual.. Everything you wear, you slay!! My inspiration! You are perfect!! I envy you!!!! I love this look!! Where are the earrings from? You are one beautiful young lady! Love this dress! I remember when! lol! I don’t know what to say, you are stunning. Another pretty color -perfect for fall…. YAAAASSSSSSS! You are giving us life with your fashion. Mimi, I agree this is a great pattern, I have made several in different lengths. As you stated this is a go to for new and fast, love, love, love this look. A must have for every diva. Hello girl, you did it again. There is no such thing as Ms. Mimi don’t have anything to wear. Love it keep on doing your thing. This dress is Gorgeous! How do I order??? Hi Mimi! I’m totally fan girling over here about this dress! I purchased the tutorial and the pattern and have not made yet. I love this green. I dont have alot in green but I think this is one of my colors. I must find green ponte knit. I didn’t know the striped red dress was from the same pattern, great look as always, Mimi! Asking questions are actually fastidious thing if you are not understanding something totally, except this piece of writing presents nice understanding yet. and if I may I wish to counsel you some attention-grabbing things or advice. Howdy! Quick question that’s completely off topic. Do you know how to make your site mobile friendly? My weblog looks weird when viewing from my iphone4. I’m trying to find a theme or plugin that might be able to fix this issue. If you have any suggestions, please share. Appreciate it! Someone necessarily lend a hand to make critically articles I’d state. This is the first time I frequented your website page and thus far? I amazed with the research you made to make this particular put up extraordinary. Fantastic task! Great goods from you, man. I have understand your stuff previous to and you’re just extremely great. I actually like what you have acquired here, certainly like what you’re saying and the way in which you say it. You make it entertaining and you still care for to keep it smart. I can’t wait to read far more from you. This is actually a wonderful site. Easy but sophisticated, practical but userfriendly, duplicate Montblanc Timewalker Twinfly watches get to be the benchmark to share with how tasteful visage is blended by modern capabilities. Because it has that desirable and basic glance which everyone might desire to possess this is. Fake Watch GMT in grün au?en ist perfekt mit einem Luxus- Gelbgold Geh?use und Armband , kick the bucket K?nigswürde vollst?ndig frei abgestimmt. Verglichen mit der letzten Creation , diese Replik Watch GMT steht mit einem Journey -Fastener Krone statt eines Side by side-Locking mechanism Krone. Was mehr ist, sobald Sie eine Analyze tragen haben , finden Sie das Armband durch einem neuen Verschluss , die Sie durch der M?glichkeit , das Armband zu erweitern bietet und hier k?nnen Sie Feineinstellung machen konzipiert. Sowie perish kreative Funktion der Replik Rolex-Uhren zu drei verschiedenen Zeitzonen zu lesen ist unn?tig zu sagen . Investigators from the Audit Office of Guyana are currently probing the radio purchases which were delivered shortly before the elections, but apparently were never put to use. There are plenty of celebrities who dress in Hublot different watches replica hublot watches large beat . Onlookers braved the rain as they snapped photos, retrieved skin as souvenirs, and even climbed onto the whale’s back. What pattern number is that? I can’t seem to find it.